In a medium saucepan, heat the cream and salt until tiny bubbles start forming where the cream touches the pan. Stir in the honey. Bring the mixture to a boil. Now reduce the heat to an active simmer and cook, stirring constantly with a wooden spoon, for about 15-20 minutes, or until the mixture reaches about 255-260 degrees on your candy thermometer. To stop the caramel from cooking, set the bottom of the saucepan in the bowl of cold water. Stir until caramel begins to thicken. Here is where there is a little bit of “art” - the caramel has to be thin enough to coat the apples but thick enough to stick. If the caramel thickens too much simply put the pot back over the burner for 10 seconds or so to heat it up a bit. 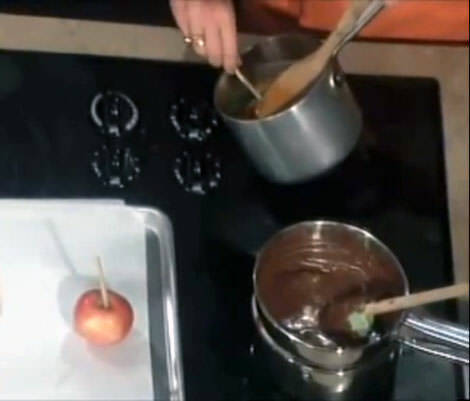 Tilt the saucepan so all the caramel forms a pool on one side, then dunk and twirl each apple until it is thoroughly coated with caramel. Place each apple on the baking sheets and allow the caramel to cool and set. Enjoy! Insert one wooden pop stick (from bag of caramels) into stem end of each apple. Cover a baking sheet with waxed paper; spray with cooking spray. Set aside. Add water; cook on medium-low heat 3 min. or until caramel bits are completely melted, stirring constantly. Dip apples into melted caramel until evenly coated, spooning caramel over apples if necessary. Allow excess caramel to drip off. Scrape bottoms of apples; place on prepared baking sheet. Refrigerate at least 1 hour. Remove from refrigerator 15 min. before serving. Store any leftover apples in refrigerator. I’ll admit it, in a pinch I make caramel apples with Kraft caramel candy! But, I am somewhat of a purist and food snob, and I take pride in using real ingredients and making things from scratch. So here is a winner that is so simple that uses 3 real ingredients. The only caveat is you need a candy thermometer but it’s worth having in your cooking gear arsenal! Caramel apples can be rolled in a variety of coatings for a sweet treat that is perfect for gift-giving or for serving on a special occasion, i.e: nuts, mini chocolate chips, drizzled chocolate, drizzled white chocolate.